Tsotsi (Presley Chweneyagae) is a gang leader who gets entangled in a crime that will doom him to a lifetime of running, threats, pain and misery. Determined to rise to the top of gangster life, Tsotsi sets out a plan to beat everyone running after him. All those changed when he found a baby and realized that he just doesn't have the evil genes to ditch the baby. Click here to check out Oscar Winning Films DVDs for as low as $2.60. 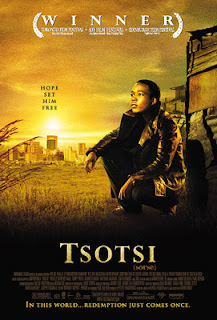 The movie invites the audience to dig deeper into Tsotsi. He looks, acts and talks like a boy from the hood. With not education, no family and no ambition, he lives crime after crime until life threw him a curve ball, he found a baby in a car he stole. The next event was predictable, a bad guy with a heart of gold but what is unpredictable is the way he opts to deal with his problems. He has clean intentions without really intending to have clean intentions. However, the simplicity of his mind and the context of his life inspires him to turn to non-traditional solutions to his non-traditional problems. That is what made the movie a fitting addition to the Oscar Winning Foreign Films list. The result puts him in even more compromising situation because his decisions lead him to carry more baggages, something no gangsta should have. The narrative follows the how the results of each of his decision affects his disposition, personality and future. It does so in a somewhat humorous and poignant way. This is a fresher approach compared to the usual melodramatic way. The direction take the tone of the character's personality. It seems that there is always something more if you pull up the sheets. The shots are simple but there are certain small details within the scene that if you bother to notice and analyze these details, you will realize that there is more to the story and the message of each scene. The shots are simple, the lines are simple and the characters seem simple but the director was able to put everything simple together to create a complex web of confusing but satisfyingly addictive stories with deceivingly adorable characters. The movie becomes impossible to forget because of the characters who are both familiar and unique, funny and pitiful, and confusing and understandable. I want to say it is gritty but surprisingly, it is the kind of gritty that looks good. It's the combination of colors and how the cinematographer positioned all the colors so that the scenes don't always feel suffocating even when the locations are cramped and poorly lighted. That's what made watching the movie relaxing. You will feel the poverty, the negativity but the scenes are not cramped. It will allow you to breath. It didn't win the Oscars for nothing. It's one of those films that you NEED to watch because it will inspire you to look at people a different way, look at situation with a different set of principle and live your life with simple intentions. Click here for other Oscar Winning Foreign Films we have reviewed.